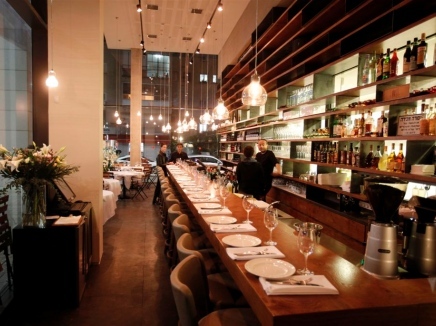 If you are looking for new interpretations of classic Israeli and Mediterranean dishes, check out Elba, a restaurant that opened in Tel Aviv in February 2012, on the lively Ibn Gvirol, an avenue lined with cafes, restaurants and bars. The restaurant is a long rectangular space with minimalist contemporary interiors bounded on the street side by floor-to-ceiling glass. Because the space is small, there are only a few tables and you are most likely to find yourself sitting at the bar. But that isn’t such a bad thing. I like sitting at the bar, gazing across the room, people-watching, or looking into the kitchen at the wonderful dishes making their way to other tables. Elba’s cuisine is an eclectic mix of French, Mediterranean and Israeli dishes served in innovative ways. Take the bourekas, a flaky pastry stuffed with spinach and cheese. At Elba, however, the flaky pastry is not stuffed with anything. It is left to stand on its own beside the filling, which is made of chard and topped with hameiri cheese and a raw egg. Although it sounds strange, the result is extremely delicious. I also had the Asian mushrooms in a (western mushroom) broth and it’s perfect for people who want to eat a light starter. There are fish as well as meat dishes such as sliced lamb on a bed of yogurt and mint, a slow-cooked lamb shoulder, French burger with nuts, and chicken roasted for 48 hours. The wine list is impressive and offers Israeli, French and Italian wines. The chef and co-owner of Elba, Yair Yosefi, has worked as a chef in France (including at Michelin-starred restaurant, Le Grand Vefour), before coming back to Israel to start Elba as well as a publishing company called A Point Books with designer Dan Alexander. Reservations are necessary. If you want a table, make sure you mention it when you call to reserve.